There's still time to play along with the June Monthly Scrapbook Challenge at Our Daily Bread Designs. This month Patter issued a Photo Inspiration Challenge with a twist. Using the photo (shown here) as your inspiration (think colors/theme), create a layout of any size, using ODBD stamps on your page, the twist is that you need to add something NEW to your page. ﻿﻿﻿﻿﻿ ﻿ ﻿ ﻿ ﻿ ﻿ I pulled the colors and summery theme from the photo, changing the shade of blue a bit. As for my something new....the Bicycle and sentiment are from the new ODBD June Release; the pattern paper is from Authentique which I picked up with this scrapbook page in mind; and the Cheery Lynn Designs Mini Fanciful Flourish and Exotic Butterfly Wings are things that I purchased from the ODBD Booth while at the Milwaukee Stamp Show last month. Because I had purchased only 1 sheet of pattern paper for my layout, I wanted to stretch the paper a bit, so I cut a 6" x 6" panel from the center so I could add layers. To add interest to the already beautiful Authentique paper, I randomly stamped the ODBD Honeycomb Background in Ranger Gathered Twigs Distress Ink. The little girl in the photo is my mom. I only had a Black and White photo, and was inspired the Tim's Tag for June to add color to the image using Distress Inks. The Bicycle image is stamped on Vanilla card stock, cut out and colored with STAEDTLER Karat Aquarell WC Pencils/blending with Gamsol. Do add extra dimension to the flowers, I stamped/colored them a second time and popped them up on dimensionals. To embellish my page, I used a variety of flowers and Flourishes from Zva Creative along with the Cheery Lynn Designs Exotic Butterflies and Mini Fanciful Flourish. 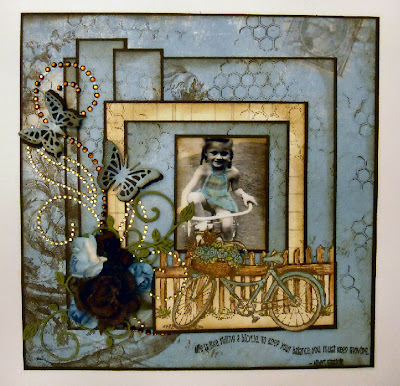 This Scrapbook Challenge runs through Saturday, June 30th, at 6 p.m. Eastern Time, click here for more details and to also view Sue and Gemiel's pages. After this month, the ODBD Scrapbook Challenge will be going on hiatus. WOW Lisa this is just AWESOME!! Love how you've used & stamped on the designer paper and the added embellishments are just PERFECT! FABULOUS job of designing! The photo of your Mom is just precious and you've certainly showcased it perfectly!! WELL DONE!! This is so beautiful! Love the layout and then you used the papers and the colors so perfectly. The image of your mom is adorable! She is such a cutey! Lisa, this is a FABULOUS layout. Wonderful choice of colors, images, and embellishments! Love this! Stunning card, Lisa! What a wonderful photo and I love how you've layered up your background. Lisa this is stunning!!! 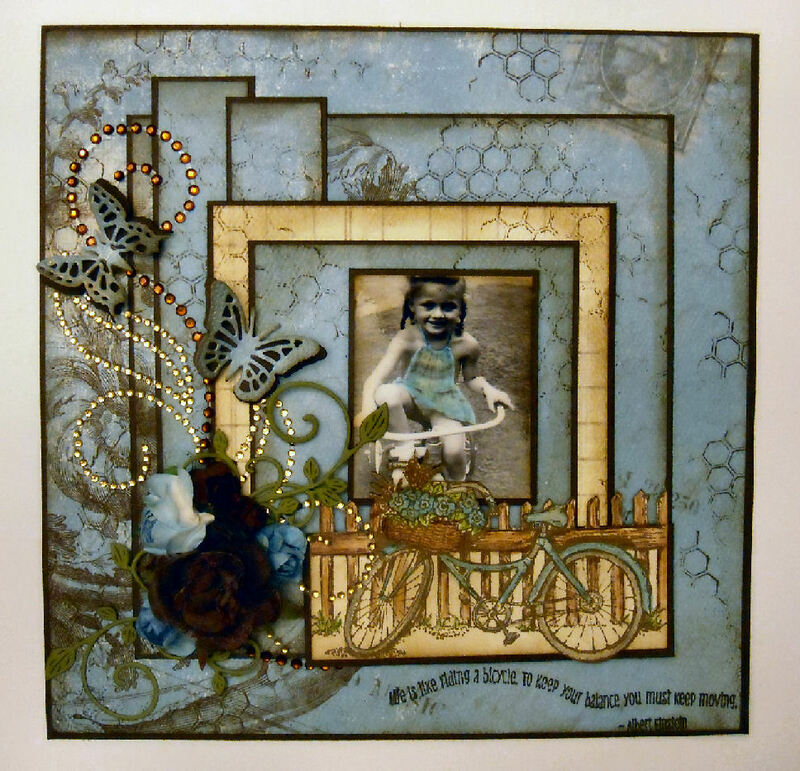 Love how you hand colored the photo and added interest to the background paper with the honeycomb stamp. Beautiful sb page, love the addition of the distress inks on the photo! I just love the coordination of your colors and the addition of the bicycle. Very creative design!! Thanks for supporting the ODBD challenge with your gorgeous layout!! Very pretty, your coloring is wonderful, and I love all the flowers and flourishes! Oh my, this is spectacular. I love how you colored the image to match the blues of the paper. Your embellishments and design with photo are fantastic. You know I just linked my June Tag and caught this out the corner of my eye and knew it would be yours! Lisa, what a great picture of your Mom! Totally stunning take on Tim's challenge! Love that you used a personal picture!